You cannot deny it. There is a sea of SEO tools that a company can use to further improve their search engine rankings by properly optimizing their websites. We have listed down the 15 tools that are very crucial for any SEO efforts in the form of an infographic along with links to each and a small explaination at the end of the infographic. 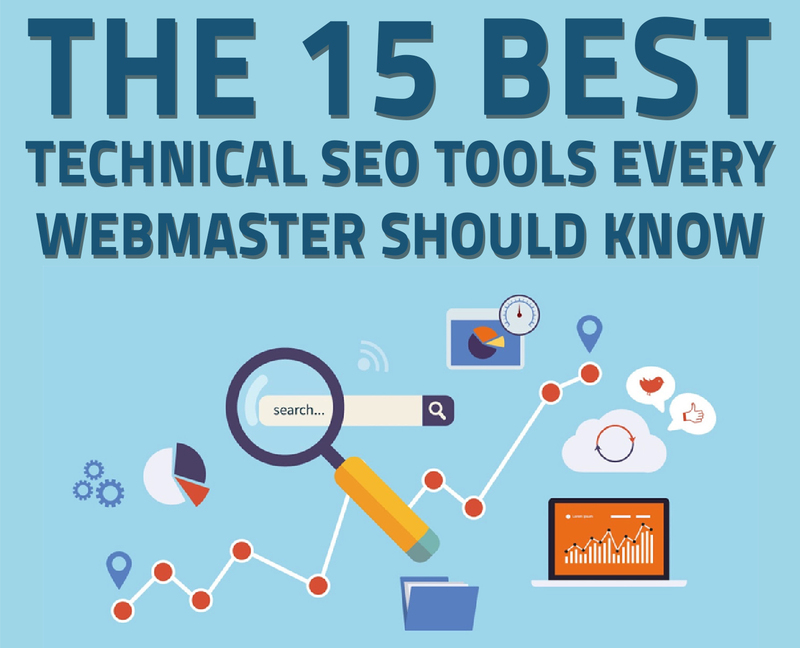 We dare say that you, as a webmaster, should master these tools by heart. Missing page titles, meta descriptions, and meta keywords. Errors in response codes, URLs, and canonicals. Google loves Google. So, what better way to improve your Google rankings by using a tool that Google made themselves? Through the years, Google Search Console has been through a lot of updates and improvements until it became the best SEO reporting tool it is today. SEO is not SEO if there are no data to analyze. Google Analytics gives you just that. Google Analytics is free and it can offer a lot of information that is crucial in SEO. Some of the things that you can determine with Google Analytics are traffic issues, penalties, and a lot more. You just really need to remember to set up your Google Analytics account properly so you can maximize the benefits you can get from it. The good thing about Web Developer Toolbar is that it is available as a browser extension for both Firefox and Chrome. Speed has always been an issue with a lot of internet users. If your website is loading very slowly, you might be losing potential customers! Fixing your page speed is very possible with the right tools. That is what Google Page Speed Insights is for. It basically gives you an insight regarding how fast or how slow your website is. Just remember that this tool can be used as a starting point and its result should not be considered the final metrics. In a nutshell, GTMetrix is a tool that provides the most accurate report when it comes to page speed. Normally, you would not associate code validators such as W3C Validator as a tool for SEO. However, it is just as crucial. A little reminder though. Make sure you know your way around codes and web development technicalities. It is very easy to confuse the results from the validator and it could make things a lot worse. What makes SEMrush so famous is that it provides accuracy when it comes to keyword and other technical kinds of research. Moreover, SEMrush offers the ability to analyze your competition. Study your way around the deep analysis sections and you will be surprised at how much you will know about your competitors. For your link analysis needs, Ahrefs can provide you with the most insightful results regarding links. By just using the link profile of a website, you can actually know how their backlinking strategy is done. Moreover, there is also the ability to determine the types of websites that are linking back to your site. It can either come from blog networks, link profiles in forums, and web 2.0 links. Like Ahrefs, Majestic is another majestic tool for link analysis. It can do what Ahrefs does and a lot more. It can locate things such as bad neighborhoods and other domains owned by a website owner. By looking at the report regarding bad neighborhood, it can be easy to diagnose different issues in a link from a site that was a result of the website’s associations. You should also keep in mind that Majestic has their own calculations when it comes to the technical attributes of a link. Many SEO specialists really do not take MozBar seriously and this is primarily because of its whimsicality. However, the tool can give you very detailed analytical data. Attributes like a domain’s authority and a webpage’s authority are just some of the crucial data you will need to craft a good SEO strategy. If you want to know more about a site that has been recently penalized, the most effective tool to use is the Barracuda Panguin. The tool connects to the website’s Google Analytics account that is in question. The GA data is then intertwined with the overlay. This overlay will make it easy to spot the possible penalties. This is a very helpful website if you are looking into doing local SEO. It really is not that technical compared to the other items on this list but it can give quite a helpful chunk of insights with technical issues that may affect local SEO. One of the most notable features of BrightLocal is its ability to make an audit of the local citations of a website. Then, you can go ahead and fix those issues in a snap! Whitespark is pretty similar to BrightLocal but it is really more in-depth. The tool’s local citation finder takes you deeper into the local SEO of your site, allowing you to see where your site is positioned among your competitors. In connection to that, Whitespark can also let you determine the local citations of your competitors. To a lot of SEO experts, Botify is considered as one of those that are really complete when it comes to technical SEO attributes. Botify has become famous because of the tool’s ability to combine technical SEO and search intent with the technical keyword analysis tool. There is really no general rule as to what tools you should to use to keep track of all your SEO activities. It all depends on your specific needs. But, no matter what your needs are, just always make sure you use these tools to make SEO a lot easier. Plus, these tools can be very helpful in making your strategies effective. Ritu from PageTraffic is a qualified Google Adwords Professional and Content Head at PageTraffic. She has been the spear head for many successful SEO Campaigns and currently oversees Content Marketing operations of PageTraffic India.